When a power supply becomes sufficiently efficient, it loses less energy from the input as heat. Given the right conditions, a very efficient and low rated power supply can be built without a fan, giving a quieter experience. The limit is always a balancing act between efficiency and seeing how highly rated the PSU can be – there is a certain segment of the market that will always prefer the quiet systems where possible. 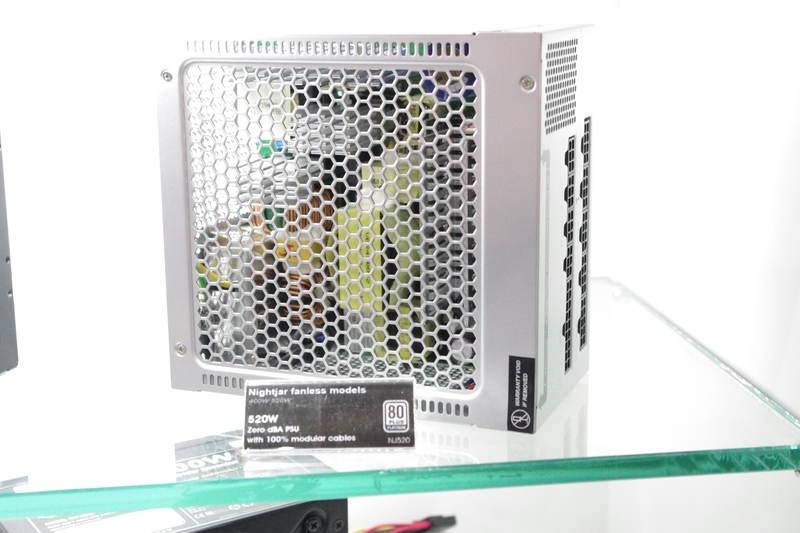 Up until this point, the peak rating I have used for a fanless PSU was 500W, from the Rosewill Silentnight range that were 80 PLUS Platinum rated. Even though Titanium rating has become a thing which might help push the limits even further in the interim, more fanless Platinum models are coming to market. SilverStone showcased a 520W Nightjar model and Enermax showed off a prototype 550W digital fanless version. 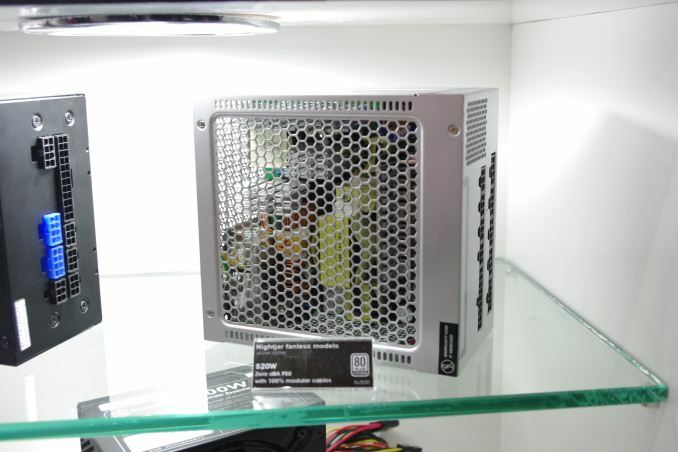 Despite the word ‘night’, this all-white PSU will come in 400W and 520W variants and will be fully modular. It seems like it will have at least four PCIe 6-pin connectors, and I assume some or all of which will also be 6+2. Due to the fanless design, it must be oriented in a specific way to maximise the airflow. 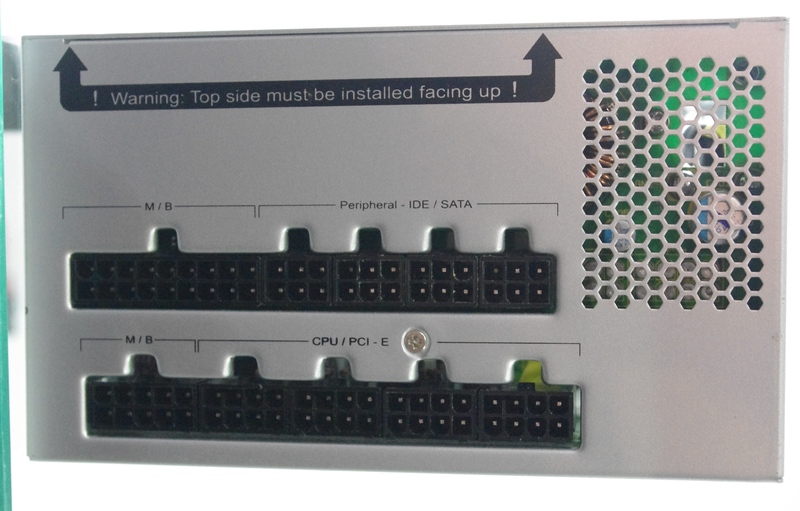 All the power is on a single 12V rail, with the unit rated up to 516W and 43A, which should satisfy all single GPU devices out in the market at stock speeds. I might have to take issue with the ‘zero dB’ claim, given that electrical noise is around 15 dB. In the past I have also seen silent power supplies with significant bulk to help radiate temperature away, whereas this unit seems fairly empty. From previous experience 500W fanless Platinum power supplies are not entirely cheap, and the Nightjar has recently gone on sale for $160. Digital-monitoring power supplies have had a rough entry into the market. They add a good amount of cost to a unit, but few users interact with their power supply on such a scale to monitor and adjust the unit for best efficiency and performance. 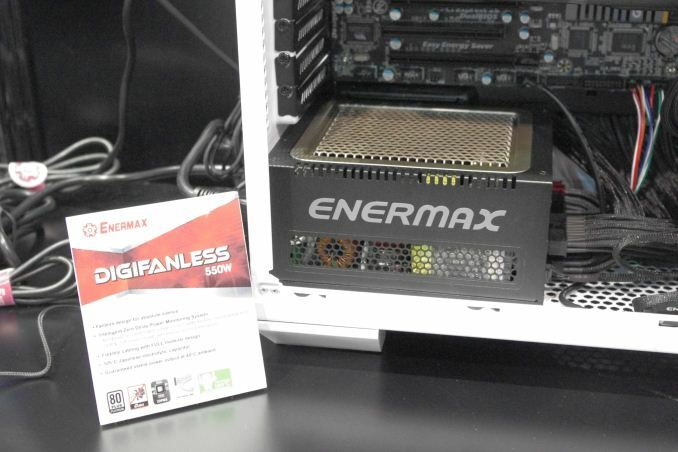 With all that being said, I have not yet come across a fanless digital-monitoring power supply, and Enermax believes there is a market for one. Unfortunately they did not have an individual unit on show that was not in use, but the design is fully modular and the system is rated at 550W. I did ask about the rating, and it turns out that 550W is a peak value, whereas the average value is more around 500W. Perhaps I am naïve in power supply marketing, but I had assumed that the wattage listed was the average due to issues in the previous decade. 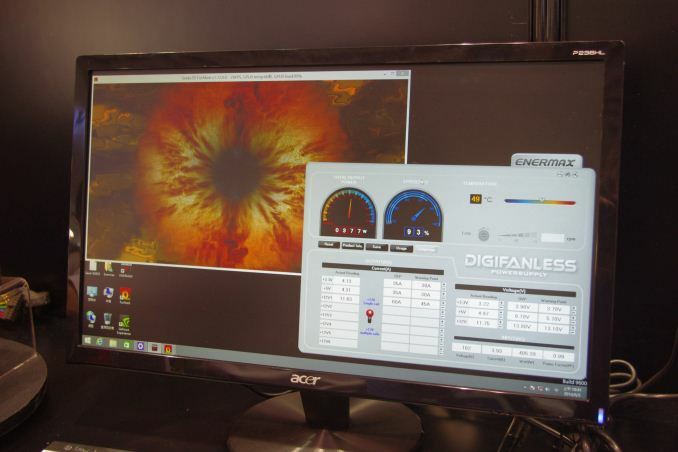 At this point I believe the Digifanless is still in the prototype stage and will be coming to various markets later in the year. "I might have to take issue with the ‘zero dB’ claim, given that electrical noise is around 15 dB." Doesn't this noise vary across configurations? 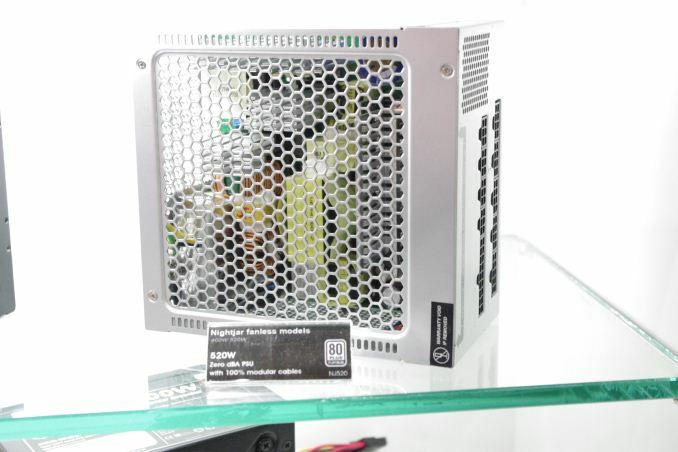 Or is this a known spec of the PSU? I've seen reports on PSUs ranging from "complete silence" to "clearly audible electrical buzzing". I'm wondering about that too. Is the electric noise only ~15dB when fully loaded at ~500w? Or would it be there when just at the desktop and idle (or like 20% or less CPU usage with a haswell i7?). 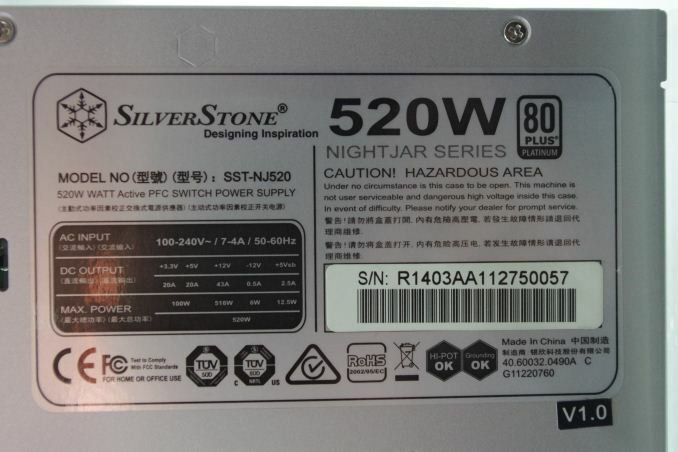 I know I wouldn't need 500w, but I figure going larger on the PSU would be better (it would stay well within temp limits since it is t always loaded) and some room to play with upgrades in the future. What happened to the Rosewill SilentNight 500W? It has a pretty much perfect 5 star set of reviews on Newegg, but has been not available for a while now. Haven't seen a replacement model..